Popular Posts is a widget which every good blogger uses. 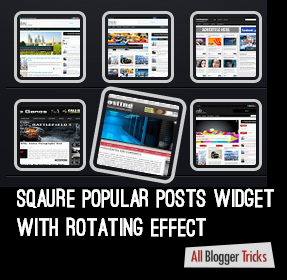 From small blogs to all big blogs you can see Popular Posts widget. It helps to decrease bounce rate of your blog. I have already added three popular posts widget in my blog. This one is a bit different and looks more elegant. It has a rotating effect when hovered on any of the thumbnail. To add this widget in your blogger blog follow the below steps given.